Version 4.73 is a refresh release that updates components and fixes a minor security issue. New OpenSSL build This version includes OpenSSL v1.0.2n, a recent release with numerous fixes and with new capabilities such as support for Perfect Forward Secrecy. For those who are wondering why we have not moved from the v1.0.2 family of OpenSSL to v1.1.x, it's mainly because the move requires a number of code changes, and we want to be sure the v1.1.x stream is completely stable before migrating to it; rest assured that we will move to it in due course though. Security fix a DLL load order bug reported by security researcher "hyp3rlinx" has been fixed. We are not aware of any exploitation of this bug to date, and it is a fairly low-impact problem, but better to be safe than sorry. 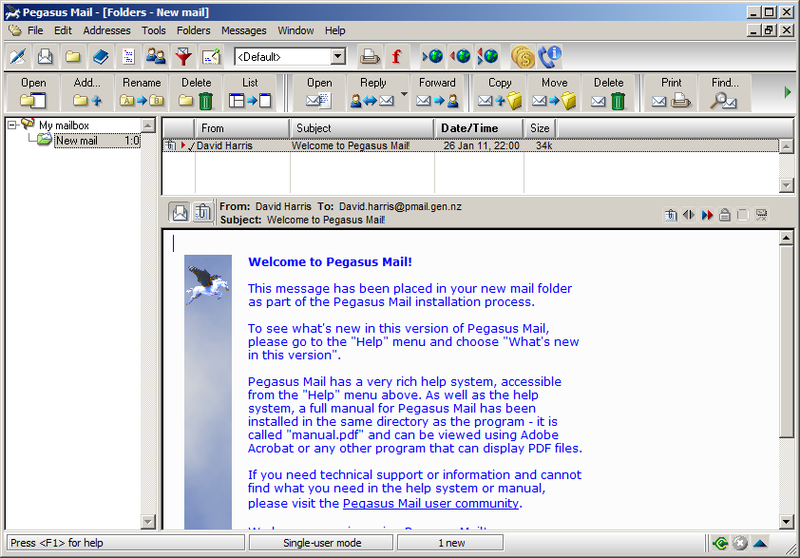 Completely updated Help system This is the first Pegasus Mail version 5 feature to make it to release - we are adding it ahead of v5 because it's extremely useful, and because it is also stands on its own well in either version. The new help file has been completely brought up to date, with a much improved appearance and a much improved table of contents and index. It is also far easier to maintain from a developer standpoint, so it should be simpler to keep it aggressively up-to-date in future. Updated HTML rendering components The arms race continues... Martin and Michael have once more put considerable time and effort into updating IERenderer and BearHTML to support the ever-changing HTML landscape: I would like to offer my deepest thanks to them for their tireless efforts in what can be a very thankless area. 666 1,374 David Harris <img src="https://www.oldergeeks.com/downloads/gallery/thumbs/Pegasus Mail1_th.png"border="0"> Jun 12, 2018 - 11:41 4.73 11.95MB EXE , out of 3 Votes.